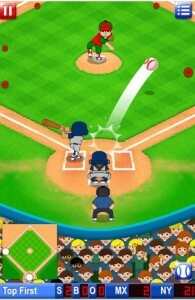 Big Hit Baseball for iPhone Review - Grand Slam or Strike Out? 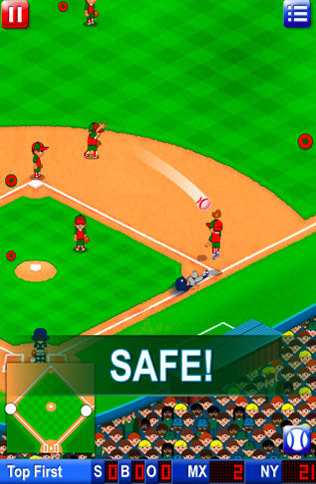 Big Hit Baseball Review – Grand Slam or Strike Out? Big Hit Baseball, developed by Denki Games and published by Square Enix, is a simple baseball game that features teams from around the world. It is a single player game that includes Showdown, where you face off against a rival team in a single game, Big Hit Cup, the obligatory tournament mode, a practice mode, and leaderboards. The first aspect of the game is batting. You simply swipe your finger across the screen when the ball gets close. It is a little awkward at first, but it is surprisingly easy to knock them out of the park after you get the hang of it. After a few minutes of practice you will be able to score at least 10 runs per inning. This is the most straightforward part of the game. 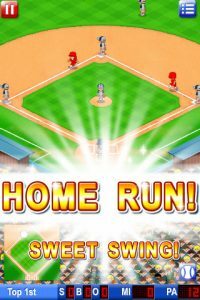 It can be pretty satisfying to score home runs so easily, but the novelty soon wears off and you realize how dull it actually is fairly quickly. You'll knock back home runs as easily as you do beers. The second aspect of the game is the pitching. To pitch you draw a path on the screen with your finger. It is simple enough, but surprisingly fun. The ball will follow the path you draw along the screen, allowing you to throw curve balls or straights. I tried drawing a figure 8, but it yielded no results. The speed of the ball is determined by how fast you move your finger across the screen. Pitching is the most entertaining part of the game, especially because you can hurl a fastball right into the batter’s face if you want to. The third aspect of the game is the fielding. The goal is to look at the screen and determine where the ball is going to land after it has been hit. 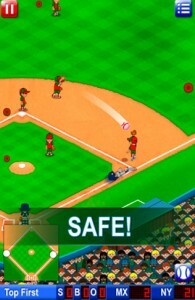 You tap in that location and, theoretically, a player on your team will dive in catch the ball. This is the most frustrating part of Big Hit Baseball because it seems like the game itself doesn’t even know what is going on. The fielding controls are so wonky and counter-intuitive that you may as well just close your eyes and tap wildly all over the screen. You’ll probably get the same results. Even after you get the hang of it, this section of the game just isn’t very fun. The sound and graphics are both adequate. There is not really any music to speak of, but the sound effects sound the way they should. Crowds cheering, bats hitting balls, that kind of thing. Though I would have liked to hear the players shriek in pain and yell things like “my eye!” when you hit them with the ball. You can tell that there is a bat and that there is a ball and that people are running after the ball when it gets loose, so as far as I am concerned, the graphics get their job done. Great kid, don't get cocky. Big Hit Baseball is a simple game that can be a fun diversion for a while, but is ultimately bogged down by the more dull and frustrating sections of its gameplay. The pitching sections can be quite fun though, so if you are a die-hard baseball fan, you still might want to give it a shot.